In my seven years of tutoring STEM courses, I have witnessed every type of student imaginable – the smart, the go-getter, the “do enough to get by,” the last-minute, the “I just want answers,” and the downright lazy. The one thing these students have in common is that they all realize, sometimes a little too late, they need extra academic help, and that’s when the Tutoring Services (TS) staff members put on their superhero thinking cap(e)s, swoop in with their pens and pencils, and save them (well, most of them) from drowning in a sea of F’s, D’s, and WF’s. Realistically speaking, given the high tutor-to-student ratio, one can only imagine that there are academic casualties in this line of work. The casualties are usually those students who lack the determination to seek tutoring help, those who wait until the hours before an exam to request a lesson in weeks worth of material, and others who just simply choose not do the work. This landscape of motivational challenges is the honest reality that my tutoring heroes and I have come — however uncomfortably — to accept. For many of our students, even the “downright lazy” and the “I just want answers,” if they come in early enough to get help and we can identify into which of those groups they fall, we can usually help them improve their scores. Sometimes, this improvement reaches as high as a full letter grade. How early ,then, should a student come in for help in order to fully benefit from the sessions? 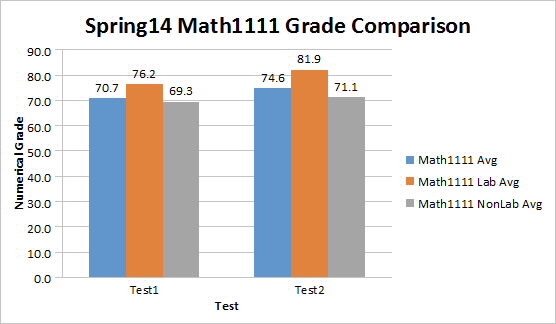 In the Spring semester of 2014, the Gainesville Campus (GC) tutoring staff collected first and second test grades from a number of GC math sections and cross-referenced them with the data obtained from the login computers in the tutoring labs. The results of the research showed many differences between the two groups across all math sections: Lab students and non-Lab students. Lab students are those who showed up for tutoring help, and non-Lab students are those did not. Let’s look at the results for the first and second Math1111 (College Algebra) test grades for the two groups (figure 1). Figure 1: Test 1 and Test 2 grades for Spring14. Sample size (N) = 244 for Test 1 and 214 for Test 2. According to the results, the Lab students scored higher than the non-Lab students on both tests – an average of a 6.9-point difference on the first test and a 10.8-point difference on the second test. In addition, the Lab students had a 5.7-point improvement (76.2 to 81.9) between the first and second tests, while the non-Lab students scored only a 1.8-point improvement (69.3 to 71.1). Obviously, one reasonable explanation for the grade improvements in both groups after the first test might include a realization on the students’ parts that they needed to study more for the second test. The Lab students, however, improved their grades significantly more than the non-Lab students. What could account for this major improvement in this group? One observation that I have made during my time working in the labs is that, once a student gets the courage to seek tutoring help and has a positive experience with it, s/he is more likely to return. My staff and I make a concerted effort at the beginning of each semester to explain to all new lab students the importance of staying on top of their math assignments and the vital importance of seeking help early. The sooner a student comes in and seeks tutoring help, the more likely s/he is going to improve his/her grade. Of course, we would like for students to come in as soon as the semester starts, but that is not a realistic expectation for our wide range of students. Based on the results of our small study, we should intervene as soon as the first tests are given and graded in order to obtain favorable grade improvement outcomes and decrease the D/W/F rate in Math1111. The findings call for an intervention program to be put in place to help our students, and future discussions regarding such a program need to take place between departments and administrators. Along the spectrum of student types, the last-minute and the “I just want answers” are the students who contribute most to the D/W/F rates, and they are the most interesting. They often come in just hours before a scheduled test and expect undivided attention and one-on-one tutoring. They seem to want tutors to use magic USB cables that transfer information from tutor brains to theirs. Or, at the very least, they expect to quickly input the information for quicky output on a single test, rather than understanding that true, deep learning comes from the scaffolded and practical instruction in the classroom. My tutors are patient with these students, encouraging them to make more frequent and early visits to the labs for tutoring help for the next test. Some of the students seem to change their ways, but most do not show up for help until, one again, just hours before their tests. Tutoring sessions with these students are usually ineffective, and, for the student, quite frustrating. My tutors understand that explaining the purposes and strategies of tutoring and of learning is a crucial component of the their interactions with all students; if the students can grasp how and why they’re learning the material, they may be more likely to seek assistance in their areas of struggle. In addition to being tutors, TS staff members also serve as counselors and advisors. Over a period of weeks of obtaining tutoring help, many students often become more comfortable around specific tutors, and they begin to create preferences. Building a great rapport between students and tutors through sharing personal math experiences is fundamental in Lab-student retention. I believe that my tutoring staff is incredibly attentive to each student’s needs and learning style. The tutors do really care about how much the tutees actually get out of the tutoring sessions. As a tutor, it is an amazingly satisfying feeling when a student returns and tells you that s/he did well on a test because you had helped him/her to prepare. Moments like that are what make a tutoring job unbelievably fulfilling. Thank you, Hieu, for this information on the outstanding outcomes of Tutoring Services. I also appreciate your commenting on how different types of students experience and profit from what you and your staff provide for them. Having spent some time observing UNG students and tutors on the Gainesville campus as they work together, I can truly say you all deliver exemplary support in so many areas.